Back of card: Blue-green scalop or seashell or turtle motif (in white). May be inverted. Comments: The introductory notes for this deck postulate Atlantis as Sardinia, which I suppose is as good as any other modern excuse. The author (Vigna?) does make the point that only the Egyptians & the Greeks had ever heard of the place & in the insular world of the Mediterranean, Sardinia is already very, very far away & much more likely to be a source of problems for the Egyptians & Greeks than an oceanic culture far out in the Atlantic. For various reasons this is a more convincing argument than the one that suggests Atlantis was a small island in the eastern Mediterranean. Myth tells us that Atlantis was a great civilization that gradually, over the centuries, sank into complete & utter depravity, which led to its total destruction. If we consider other great civilizations, we quickly see that the greatest, longest lasting civilizations are those of considerable land mass. Two immediately come to mind: China and India. If this is true, then Atlantis must, by definition, have been considerably larger than Sardinia. Moreover, why would some small, defunct island have rated so highly with Plato's Egyptian sources? There are many such islands in the Mediterranean, many with unique & great cultures. But none of these were ever able to dominate the shores beyond, and, for the most part, few of them lasted more than a century or two. None of them were more than a passing interest to Egypt, and I doubt any of them could have posed it a serious threat. So why should Egypt have feared any Mediterranean-based island culture, why would they have been more than mere shore raiders or pirates to them? In other words, why was Atlantis memorable? It might be that Plato & his Alexandrian sources were actually referring to some other civilization, which, for reasons unknown they then transferred to an imaginary island. But if so, what civilization was it, and where was it? If we deduce that Plato's Atlantis required a land mass larger than any available Mediterranean island, we must still find that land someplace on the globe. So by process of deduction we are gradually led back to Plato's own statement, that a large island/continent once existed in the Atlantic Ocean. At its end, Atlantis was said to be a land of systemic failure, which this deck shows most strongly. 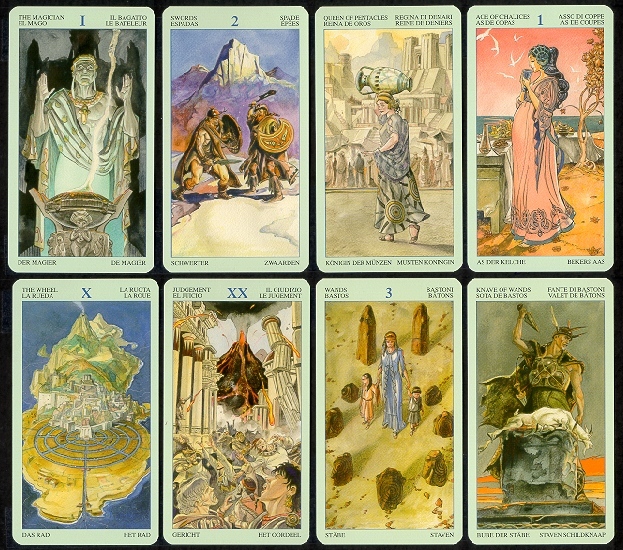 The major arcana show the corruption of the ruling classes generally. Cups show sensual & sexual debauchery. In Pentacles we see that everything has a price. In Wands, we see the worship of the idol. Swords give us warfare for its own sake. I'm not sure how you could do a reading with a deck this grim, and even if we speculate that America is going rapidly down that path, I don't think you would find many of them who would admit that, nor who would think this deck to represent their hopes & ideals. Of course, the actual instructions for this deck ignore all that. They are all simple boilerplate. This is disappointing. Lo Scarabeo is publishing some great decks. They should take more time with the accompanying notes.